In his "Notes on the Illustrations," Richard A. Vogler comments on the scene in which brother and sister must part forever. The Crown has not prosecuted the daughter for involvement in her brother's crimes, perhaps for lack of hard evidence. She and her brother now go their separate ways, he to death from disease aboard a hulk, she to suicide at one of London's bridges. He describes the girl as "distraught" and her brother as shocked at the harshness of his sentence. Vogler contends that the boy seems "remorseful." He theorizes about the meaning of the cloth on the boy's leg, suggesting that it represents an attempt to spare his sister's feelings: “The convicted criminal has an iron on his right leg, but it is temporarily tied at the top with a piece of cloth, apparently because the authorities had allowed him to see his sister without wearing the full set of leg irons” (p. 162). The illustrator uses strong verticals and bars to reinforce the son's status as a convicted felon, and suggest in the spartan visiting room's interior the kind of life he must henceforth lead. The funereal clothing of the turnkey adds to the sombre atmosphere, contrasting the snuff coloured suit worn by the Drunkard's son. As warder calls the sister away, the young man begins to realise that he is utterly alone, and will see neither familiar faces nor locales ever again. The prison functionary effectively blocks their way as the light plays about the pallid figures of the stunned brother and tearful sister. Presumably the brother is now mulling over the consequences of his crime, including the meaning of transported for life. The Sentence of "Transportation for Life"
In trying to understand how the Drunkard's son, although a first-time offender, can be sentenced to life transportation for a robbery, the viewer realizes that Cruikshank is struggling to have the viewer continue to sympathize with the Drunkard's children. Consequently, the artist mitigates the larceny that the boy has committed by not adding a murder charge, even though by this point in history the boy's crime would not have merited a life sentence unless it involved a capital offense such as murder. 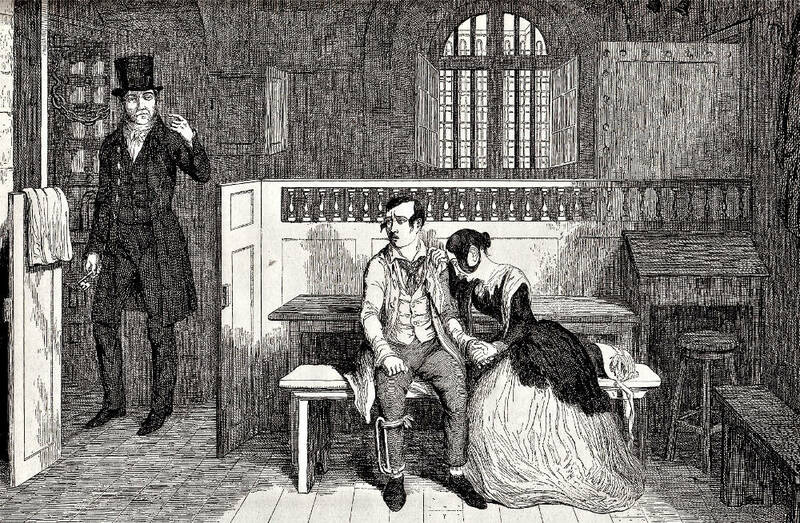 The final scenes in the 1848 sequence demonstrate the flimsiness of Cruikshank's contention that alcoholism causes parental neglect, and thereby turns an alcoholic's children into criminals. As Harry Stone remarks of this critical issue that divided Dickens and Cruikshank, “the origins of poverty and crime, the intricate gestation of neglectful or rejecting parents, the ravaging inception of ignorance, cruelty, and despair — all these and more, in the gospel of Cruikshank, were simply by-products of strong drinks” (p. 236). By the time that Cruikshank composed The Drunkard's Children in the late 1840s, being a "returned transport" was no longer a capital crime: the last convicted felon to face the death penalty for returning "from Australia was hanged in 1810, and the offence had not been a capital one since 1835" (Williams, p. 8). In every way, then, Cruikshank has made his young protagonist the subject of an inflexible, inhumane, and antiquated system: sentenced to life transportation for robbery, he dies (probably of typhus or cholera, but perhaps of cirrhosis of the liver) aboard a hulk, and never gets to see Australian shores. "What is this?" inquired one of the magistrates. — "A pick-pocketing case, Your Worship." Chesson, Wilfred Hugh. George Cruikshank. The Popular Library of Art. London: Duckworth, 1908. Cruikshank, George. The Drunkard's Children. A Sequel to "The Bottle." London: David Bogue, 1848. Harvey, John. "George Cruikshank: A Master of the Poetic Use of Line." George Cruikshank: A Revaluation. Ed. Robert L. Patten. Princeton: Princeton U. P., 1974, rev., 1992. Pp. 129-156. Paroissien, David. The Companion to 'Great Expectations'. Westport, Connecticut: Greenwood, 2000. Richardson, Betty. "Prisons and Prison Reform." Victorian Britain, An Encyclopedia, ed. Sally Mitchell. New York and London: Garland, 1988. Pp. 638-41. Stone, Harry. "Dickens, Cruikshank, and Fairy Tales." George Cruikshank: A Revaluation. Ed. Robert L. Patten. Princeton: Princeton U. P., 1974, rev., 1992. Pp. 213-48. Williams, Tony. "Over the Seas and Far Away, or the English Gulag — Transportation and the Hulks." The Dickens Magazine. (2000) Vol. 1, No. 1, pp. 8-9.